This is Charlotte, the beloved black lab who passed away during the last year and will be remembered at Huber Vineyard in the Santa Rita Hills on Sunday, October 14 during the Santa Barbara Celebration of Harvest Weekend. As a dog lover myself, I love to support winemakers and vineyard owners who help us get to know their wine while benefiting worthy animal causes, like the Humane Society. 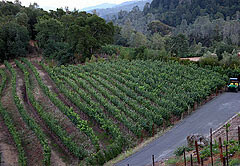 On October 14, the Hubers will be sponsoring a wine tasting at their vineyard off Rte. 246 where they will be pouring their 2005 Dornfelder Reserve (aka "Charlotte's Reserve"), along with some help and additional wine contributions from fellow wine makers Kris Curran (you know how I feel about her wine! ), Bruno D'Alfonso (from DiBruno and Badge wines), and Steve and Mary Russell of Prodigal Wines. 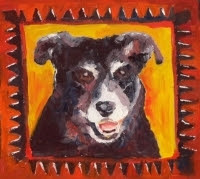 The cost for the tasting will be $10, and all proceeds will benefit the Santa Ynez Humans Society. Good wine, and a good cause, too. If you make it up to Santa Barbara wine country that weekend, be sure to check out all the other events happening around the Celebration of Harvest Weekend. With activities and tastings that last from Friday through Monday, it's a great time to make the trip to Santa Barbara if you are within driving distance of it in California. You can purchase a Vintner's Visa for just $35 that will admit you to your choice of 12 winery events amid the beautiful grounds of participating wineries. Tickets for the celebration festival are $65, which include tastings at Rancho Sisquoc of wines from more than 90 wineries, food demonstrations, and other activities. (And if you buy a festival ticket, the price of the Vintner's Visa drops to just $25). It's harvest time, so get out there in the vineyards if you can, enjoy the company of your loved ones and fellow wine makers, and don't forget to remember Charlotte at Huber Vineyards! I just got word from Amy and Peter at Black Sheep Finds (the folks who make the great Hocus Pocus Syrah that I had for Wine Blogging Wednesday #30 a while back) that they submitted a video to the Wine Spectator's Video Contest and they among the finalists in the top 5. The video's great! (They say its cheesy, but I like seeing the bottle machine in action...) It shows how hard the work of making wine can be, the commitment it takes to turn the dream of making wine into a reality, and just how little money most folks make. And where did those pesky labels go?? Click on over and check it out, and of course vote for Amy and Peter's video if you are at all inclined. If they win, they will get to go to the Wine Spectator Grand Tasting in NYC. Based on what I've seen, they could use the vacation! I am so sick and tired of having either a) smudged, greasy looking glasses or b) foamy wine. This problem is compounded in our house, I realize, because of my enormous affection for Riedel O glasses. These stemless wonders have kept after-dinner hysteria to a minimum since we are not walking around with dustpans and brooms. 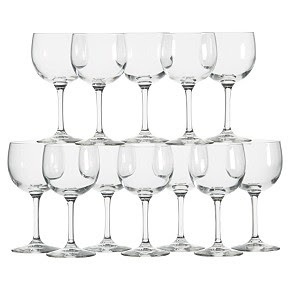 Frankly, we are too klutzy to wash stemware routinely, either by hand or in the dishwasher. So I've been surfing the 'net looking for advice, and tried just rinsing with hot water (this left smudges, and wine glasses are always hard to dry by hand); running them through the dishwasher but not the heated dry cycle (on the premise that this will keep the soap from baking onto the glasses) which didn't help much, frankly; handwashing with very hot water and a gentle soap (better, but I was still left with lots of glasses all over the counter and a little bit of a foaming problem). What is a wine lover to do? There is some reason for hope, however. Recently, on the advice of Consumer Reports, I purchased these tiny little dishwasher tabs from Cascade (Cascade 2-in-1 Action Pacs with the Power of Dawn) that have a dollop of Dawn liquid in them. Previously, I've tried liquid detergents (leave a film), dry detergents (leave grit and I find lead to fogging), other tabs (Electrasol pretty much diamond plated everything in film). These Cascade tabs, however, just gave my Riedel O glasses a wash that removed all the fingerprints, but passed the "no foam" test after washing. Maybe it was a fluke, but I'm hoping it's not. How do you wash your wine glasses? Even if you aren't Martha Stewart, please leave your glass washing tips and tricks below. My guess is that I'm not the only one grappling with this problem. As regular readers know, I seldom drink a wine that creeps much above $20. Occasionally, however, I make a little splurge and try a wine that is around $30 (or above...) just to see what (if anything) I'm missing. Some of my regular splurges include Larkmead cabernets; almost anything by Tablas Creek, Owen Roe, or Kris Curran; pinot noirs from Fort Ross, Sineann, and Eric Kent; and Eric Kent chardonnays. Sometimes, it's worth it to splurge even if it's just for a meal after a long day at work. It makes me feel pampered to open up a wine that costs a little bit more, especially if it delivers more in the flavor department. There are few guarantees, however, that spending more on a wine will necessarily result in a wine delivering more bang for the buck. As a result I'm careful with my splurges. In the past, I've only splurged on wine when I know that I like how the winemakers in question handle the grapes based on my experience with wine tastings at the winery, at wine shops, or at big events like Pinot Days. In other words, I have to know I like the cleanness of the wine, the quality of the fruit, and the deliciousness of the end product before I plunk down more than $20. Recently, though, I've been taking more and more recommendations from folks on the 'net, including consumers on CellarTracker! and fellow bloggers. Among the consumers over at WineQ--another site that has great reviews from folks who have had the wine you're thinking about buying--there was a fair amount of consensus that the 2003 RustRidge Chardonnay was a wonderful wine that was worth the money ($29.99, WineQ). I put it in my Q a few months back and received it before the summer heat. It was waiting for me when I needed something to pair with a chicken pasta dish tossed with some green beans and a compound butter made with cashews (note: I threw in some parsley and garlic with the butter and cashews, as well). This was one of the best domestic chardonnays I've had in a while--probably since my last Eric Kent. When I poured it out into the glass it had the color of bright straw, and aromas of pineapple, apple, and vanilla-cream. These delicious aromas dominated the flavors, too, and added to them came a lovely butterscotch note as you held the last drops in your mouth. It was a perfect foil to the rich, subtly-flavored pasta dish. And this is how I like my chardonnays to be oaked--with finesse and restraint. (RustRidge uses a mix of 1-3 year old French oak barrels, and leaves the wine in there for a year). The overall impression that was left was one of cleanness and richness. This chardonnay was just as wonderful as my fellow Qers said it was, and even at just shy of $30 represented very good QPR given its balance and complexity. And that's what I'm looking for when I splurge a bit on a wine--more balance, more complexity, and all the great varietal characteristics that make wine distinct (and a distinct pleasure). What have you splurged on recently? I love fall. It's my favorite season, and it always takes me back to college days in New England, when the crunch of falling leaves and the smell of apple cider seemed to surround you in a colorful cloud. 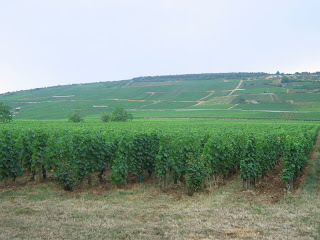 The 2005 Domaine de la Charmoise Gamay comes from the Loire's Touraine appellation rather than the from the Beaujolais region of Burgundy that is usually associated with the gamay grape. ($13.00, Colorado Wine Company; available at other merchants for just over $10) The wine opened with a bright ruby color, and a disconcerting smell of tinned green beans and asparagus. Despite the aromas, the palate was pure bing cherries with a little bit of spice around the edges. As the wine opened, the vegetal aromas were replaced by more spice and fruit and the flavors knit together into an attractive cherry, smoke, and clove profile. I actually think this wine would benefit from short-term cellaring, perhaps for 6-12 months, and may even improve further after that based on how much the wine changed over a few hours. This had many of the textbook characteristics of gamay, and represented very good QPR. Domaine de la Charmoise is owned by Henri Marrionet, who believes that his corner of the Loire's terroir is best suited to gamay, cot (malbec), chenin blanc, and ramoratin grapes rather than the better known cabernet franc and sauvignon blanc. Marrionet uses minimal pesticides, and his gamay is fermented with indigenous yeasts so there is not a note of banana or bubblegum in the wine. There is an excellent profile of Domaine de la Charmoise (as usual!) on the Wine Doctor's site, if you are interested in learning more. Enjoy the first wines of fall! Today is OneWebDay, a day for people to celebrate online life, reflect on the positive things the internet has brought into your life, and to work to protect this amazing resource and provide internet access to more people in the world. As a blogger, I know first-hand how much the internet can change your life, and as an educator I know how much younger generations of readers and thinkers are coming to rely upon it for news and information of all kinds. Do something today to make the internet a better place. Go to a site that enlightens or entertains you. Leave a comment, even if you are normally a lurker, and become a more active part of the internet revolution. Don't know where to go first? Pick any of the links on my sidebar, and begin the journey one step at a time. You already know what some of my favorite 6 dozen wine sites are, so no need to list those! But they make for good OneWebDay surfing, too. After months on the Sonoma Coast, and then the start of classes, and then a trip to England, it's been a while since I hit the road and checked in with my local wine shops. The challenges of locating Portuguese wine in LA for WBW#38 gave me the perfect excuse to run around the Pasadena area. Unfortunately, I found absolutely no Portuguese wine to buy. Fortunately, I found lots of other good stuff! My first stop was Colorado Wine Company, where they had some nice Spanish bottles of wine, and some great looking French wine, but no Portuguese wine other than a verdejo and I want to try to get bonus points this month! I could have bought one of every bottle of their French regional wines, but instead heard the voice of Joe from Joe's Wine Blog nudging me towards the gamay, which I haven't had for a while! 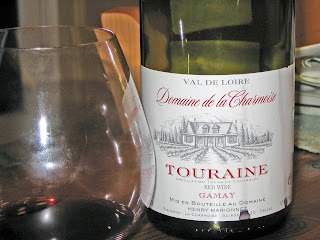 I left the store with a nice bottle of gamay from the Loire, the 2005 Domaine de la Charmoise Gamay Touraine ($13.99). I've never had a gamay from these region, and am looking forward tot he experience. Next, I stopped at Mission Wines in South Pasadena. No Portuguese wine there, either, except for a white that wasn't inspiring. I did, however, notice that they have a nice selection of Four Vines wines available, along with offerings from Sean Thackrey and Core so if you are in the mood for some more expensive treats, I highly recommend checking out Mission Wine. Added bonus: this Saturday from 12-4 they are having a wine tasting (just $5 with any wine purchase) that includes some nice Spanish and Spanish influenced offerings, like the 2006 Core C3 Tempranillo and the 2006 Onix Priorat Classico. Both of these wines retail for under $20, and you get to taste them first! I had the Core C3 at the Family Winemakers, and it was dynamite. Last, but not least, I had a little buying binge at Chronicle Wine Cellar behind the Pie and Burger. With lots of exotic grapes dancing through my head after WBW #37, I found a 2005 Durigutti Bonarda ($7.95) from Argentina and a 2005 Domaine des Cassagnoles Vin de Pays Cotes de Gascogne ($6.95) that has ugni blanc in it which I've never had. I also couldn't resist a 2005 Domaine de la Frutiere Muscadet Cuvee M ($8.95), a 2002 Maxwell Four Roads shiraz-grenache-viognier blend ($14.95), and a cute 500ml bottle of the 2003 Enkidu Petite Sirah from the Napa Valley ($11.95). Hopefully this will inspire all the LA area readers out there to go and visit a wine shop or two this weekend and get your own bottles of these interesting, affordable wines. NV/MV: Nothing Wrong With That! When you see NV (non vintage) on a wine bottle, what does it say to you? Does is say, "run away, this is a not very good wine?" Do you find yourself going past NV bottlings in wine stores in search of something with a vintage on it, even if you know nothing about vintages and aren't even sure that vintages matter in under $10 California syrah or chardonnay? Have you ever bought an NV wine that wasn't a sparkler? It is my opinion, wine lovers, that there is absolutely nothing wrong with NV wines. I've had NV sparklers, reds, and whites. I don't recall that I've ever had a bottle that wasn't good to drink and awfully good value for the money. But NV wines still carry something of a stigma about them. To combat this prejudice, some vineyards are now labeling their formerly NV wines as "MV" wines--multiple vintage--to make the case that what you are drinking is actually a blend of juice made from grapes picked during different harvests. If you are already drinking blended varietals, why not blended vintages? Now it is true that many NV or MV wines do not have the distinctive character that sets apart their vintage-designated siblings. Climate and growing conditions alter the quality and quantity of every harvest, and one of the things I love about drinking wine is that each vintage can differ from those that have preceded it. That's one of the reasons wine buffs love vertical tastings. But if you're looking for a good, everyday wine don't neglect the NV or MV bottles you might stumble across in the wine shops. During the past year I've had more than 30 NV or MV wines, many of them sparkling wines from the US, France, and Italy. But I've also had some good still wines like the NV Sharpe Hill Vineyard Ballet of Angels, and the NV Saint-Cosme Little James's Basket Press. 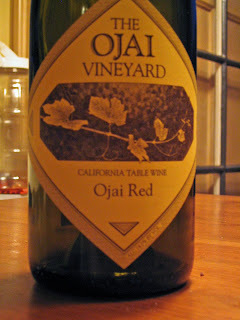 My most recent foray into NV still wines came about with the help of domaine547, who gave me a bottle of the NV Ojai Vineyards Ojai Red to try. ($19.99, domaine547) Ojai Vineyards make some superb syrah and pinot noir, which is outside of my normal, everyday wine price range so I was excited to be able to taste their much more affordable NV bottling. It was a very good mystery blend that clearly is based on syrah grapes. I thought it might contain some pinot noir, given its blueberry aromas, but domaine547 is sticking to the syrah theory! It's color was dark ruby, almost purple, and in addition to blueberries I smelled plums and rose petals. Tasting the wine, I detected blackberries and blueberries, freshly cracked pepper, and just a touch of cedar. The wine wrapped things up with a brambly finish of berries, herbs, and more cedar. This was a complex wine, and it took a while for it to open up and really shine, but when it did it was so enjoyable, and represented very good QPR. So next time you see a NV or MV wine, don't just pass it by. Give it a try. Fall is the time when many wine drinkers' fancies turn to red wines, and Eric Asimov and his tasting panel at the New York Times have come up with a list of ten under $10 red wines for you to consider. Topping the list (and of potential interest to those who will be participating in next month's Wine Blogging Wednesday on Portuguese table wines), is a 2002 Casa Cadaval Ribatejano Padre Pedro. I only found merchants on the east coast who stocked this wine, but it sounded like a beauty. Also on the list were wines from France (including the easy-to-find 2006 Georges Duboeuf Beaujolais-Villages), Spain (the 2005 Vina Gormaz Ribera del Duero Tempranillo), Argentina (the 2005 Altas Cumbres Cabernet Sauvignon), Uruguay (the 2006 Domaine Monte de Luz Tannat), Australia (the 2005 Paringa David Hickinbotham Individual Vineyard Cabernet Sauvignon), and California (the 2004 Ravenswood Vintner's Blend Merlot). This is an article worth reading not just for the specific recommendations, but because Asimov highlights regions (some less than familiar to most wine drinkers, such as the Vaucluse) that have good value wines. Check out the list, see what you think, and feel free to add your under $10 red wine finds in the comments below. As always, I'd love to hear from folks who have had one of these bottlings and has an opinion they'd like to share! I just flew a transatlantic United Airlines flight, and this topic was much on my mind--especially as I'd been upgraded to business class in exchange for a zillion miles. As always, I sit in international business and wonder how I will ever survive my next coach journey because it really is SO much better. And yes, the wine is better too. Is if $4000 better, however? I don't think so. When I got handed the menu, the first thing I looked at was the extensive wine selection picked for United by Doug Frost. Who is Doug Frost? One of the few to hold both a Master of Wine and a Master Sommelier distinction, it turns out. And his picks were really not bad, and they went well with the food. What was terrible was the temperature at which the wines were served (whites way too warm, and reds even warmer) and the itty bitty shot glasses on stems that passed as wine glasses. I had First Class in my sights, and can report that they got better glasses--but not much better. And the wines in First Class didn't actually look better, either. They were getting Kim Crawford Sauvignon Blanc--we were getting a choice between the 2005 St. Supery Sauvignon Blanc and the 2005 Karst Kallstadter Kobnert Riesling Kabinett Trocken (I picked the second and had it been a tad cooler it would have been a very refreshing choice to accompany the curried chicken and rice that I had for dinner). I honestly couldn't read the red wine labels in First Class, but one looked like a Bordeaux and the other like a California red. Back in Biz, we had a choice between the 2005 Delas Freres Cotes du Rhone Saint-Esprit (which was really very good) and the 2004 Trapiche Oak Cask Cabernet Sauvignon. And they served NV Drappier Carte d'Or Brut Champagne and Sandeman Founders Reserve Port, too. I returned in steerage--um, coach--rather than business class, and the wine was absolutely positively undrinkable. It was also unrecognizable. I'd never heard of any of them before, and as you know I do drink wine fairly regularly! 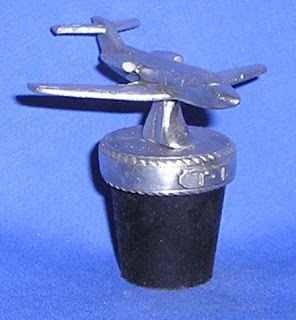 My advice is stick to water if you're flying economy. It's better for you anyway. And if you're in business, remember that the wine they're serving you costs around $10 a bottle--nice, but not $4000 nice. Save your money and spend the $4000 on a nice wine refrigerator and $1000 worth of wine to put in it. I've commented on the versatility of sauvignon blanc before, but never expected that it would go with a great grilled Greek dinner. The warm LA temperatures have not been conducive to cooking indoors, so our grill has been getting quite a workout. And our arteries can only take so much red meat and sausage. So when I found a recipe for grilled shrimp with chickpeas and pitas, I grabbed it. Shrimp brushed with oil and seasoned with a simple mix of salt, pepper, and oregano were threaded onto skewers and popped on the grill next to some pitas brushed with butter or olive oil. 4 minutes later (!) we had dinner, combined with some flash-heated chickpeas mashed with garlic, lemon juice, and parsley. Throw together a Greek salad, and you're all set. With it: sauvignon blanc, of course. We had the 2005 Preston of Dry Creek Valley Sauvignon Blanc ($11.95, Chronicle Wine Cellar; available from other merchants for under $20). 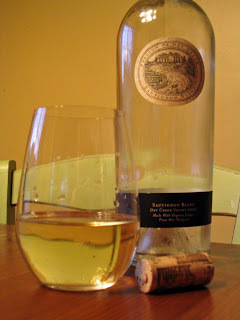 This delicious, medium-bodied sauvignon blanc had rich aromas of juicy melon, rich fig, and warm hay. As the wine flowed over your tongue, flavors of melon continued and there were notes of citrus and cream that made the wine both lively and round. As the flavors fade, the wine remains crisp. Like all Preston wines, this was made with organic grapes, and it represented very good QPR. A lot happened on the Wine Blogging Wednesday front yesterday. Both the roundup for WBW #37 on indigenous varieties and the new theme for WBW #38 were posted. First, Dr. Vino had a very successful WBW #37 where he encouraged folks to go native and drink indigenous varieties. There were 52 entries, and a lot of first-timers which is always good to see. The reviews look terrific, and there are some wines I will be seeking out. Check out the roundup, complete with hyperlinks to the reviews, by clicking here. It's a great resource for those of us who are trying to learn more about wine. Second, Ryan and Gabriella at Catavino will be our hosts for WBW #38, which will be focused on the wines of Portugal. Ryan and Gabriella want us to try to steer away from the port and madeira most of us are familiar with, and even the Douro if we can (not sure I can manage that!) and focus on Portuguese table wines. They've made up a packet of hints and tips to help us find the wine and as usual given us lots of helpful information to get us started. Find your wine, taste it on or before October 15, and send the links to Catavino for inclusion in the roundup. Have fun, and join this great online event. It's time once again for Wine Blogging Wednesday, the online virtual tasting event started more than three years ago by Lenn Thompson of Lenndevours. This month our host is Tyler Colman, better known in the blogosphere as Dr. Vino. He set the theme of indigenous grapes for WBW #37, and asked us all to find a wine that was made with grapes indigenous to its place of production. He also asked us to steer clear of the big grape varietals--sauvignon blanc, cabernet--if we could. That left me with choices from the Loire, the Languedoc-Roussillon region, and from Spain. Or England, which is where I'm writing to you from at the moment, but it turns out England doesn't have a native grape--or not one that I could find. The wine I chose was from Spain, and is a classic bargain sparkler. The NV Cristalino Cava Brut is made from not one, not two, but three indigenous grapes: macabeo, xarel'lo, and parellada. (Whole Foods, $8.99; available practically everywhere else for between $3 and $8). All three varietals produce acidic, citrusy juice that is blended to produce Spanish sparkling wine. As budget sparklers go, I was impressed with the very good QPR that this wine had. Interesting aromas of bread dough and lemon give way to a citrusy palate with an edge of buttered toast. While this was not as complex as a vintage French champagne or US sparkling wine, it had much more complexity than many of the proseccos that are available at this price point. As a result, it would be a great bubbly for making mimosas at brunch, but it was good on its own with food, as well. I would definitely buy it again. And again! Thanks to Dr. Vino for hosting such a great event, one that had me hitting the reference books to find out where grapes came from and which wines they made. When the roundup is posted I will, as always let you know, as well as giving you a heads-up on the theme for October's WBW #38. There are a few possible explanations. But one leading reason is that most folks drink white wines young and fresh--they don't cellar them, and they often don't spend much money on them in the first place so they aren't seen as an investment that demands a lot of time and thoughtfulness. 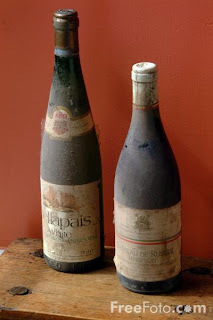 In the case of reds, however, many wine drinkers do age their wines, and are willing to pay hefty price tags for their favorites--both of which lead to a desire to know more about what will soon be taking up precious financial and storage resources. Robinson points out that this ongoing media fascination with reds is especially odd given the kinds of food we tend to eat these days--chicken, fish, vegetables and other foods that go far better with white wines. And she provides some good tips on white wines that do improve with aging and deserve a place in your cellar. Chardonnay, for example, is a white varietal that often shines after a little cellar time. Recently, I pulled out two older chardonnays--a 2001 chardonnay from Burgundy, and a 2003 chardonnay from Oregon--to see whether they agreed with my palate. I didn't buy either one of these wines specifically to age, so take my findings with a grain of salt, but I felt that in neither case were the wines necessarily improved with their extra time in bottle. First, there was the 2001 Domaine Anne Gros Chardonnay ($16.99 on sale; now I can't find it anywhere else, but you can buy a more recent vintage for under $30). 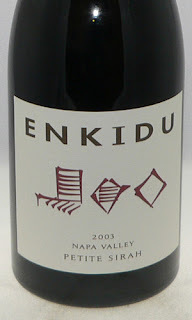 Recent tastings that others have had of the 2006 wine suggest that this may be a wine that is best drunk young. This is the entry-level wine for the talented Anne Gros, and I think this was past its prime. The aromas of toast, butterscotch, and apple were very promising, but these notes did not emerge in the flavors. When you took a sip, it was flat a bit acidic on the palate. I didn't store it myself, so there is no way of knowing whether this was because of improper storage somewhere in its life, of whether it was just a bit tired. The next older chardonnay I tried was the 2003 Argyle Chardonnay ($8.99, Costco; available elsewhere for around $14). This wine was sealed with a Stelvin closure, and was holding up pretty well with pear and lemon aromas that were muted and subtle. More pear flavors emerged as you drank the wine, which veered towards apple towards the end and was accompanied with a high, citrusy note. There was a creamy, tangy finish that reminded me of creme fraiche. What was interesting to me was to compare my note with one made by Jerry Hall at Winewaves in September 2005, almost two years ago. He found much brighter aromas, and much tarter flavors. The creme fraiche I seemed to taste was a "butterscotch twang" when Jerry drank the younger wine. Based on this experience, I'm not sure how to proceed with cellaring white wines. Is it worth the space in my cellar, given my preference for crisper, fruitier whites? Am I buying the right kinds of white wine to cellar, or should I steer clear of chardonnay for the moment and focus on rieslings or some other varietal? If you've got experience cellaring white wines, I'd love to hear your advice. And if you have questions, like me, feel free to leave them in the comments in hopes someone will know the answer. Serving wine at the right temperature is a difficult business. As a rule, in the US we tend to drink white wines too cold, and red wines too warm. If the wine you're serving for dinner tonight is a red, and has high alcohol levels, you may not be happy if you don't chill it down a little first. But how much? Take zinfandel. Experts disagree on the ideal serving temperature. The Wine Taster recommends serving zinfandels at 62 to 67 degrees which is too warm for me. Vino! suggests serving temperatures of 60 to 80 degrees. If I drank a zinfandel at 80 degrees I guarantee you I would find it tasted hot, alcoholic, and raspy on the throat. But 60 degrees sounded too cool. I thought I'd give it a try and see. I pulled a zinfandel out of my wine refrigerator, which keeps wine between 55 and 58 degrees and let it sit out for a bit while I whipped up some quick grits with cheddar cheese. I was going to top them with some spicy black beans and sauteed peppers, and the zin would make a good pairing. Ten minutes later, the grits were done, the peppers sauteed and tossed with the black beans, and the wine had come up a few degrees to around 60. It was utterly perfect to my palate: smooth, spicy, and yes, even refreshing. My 60 degree zin was the 2003 Carol Shelton Monga Old Vines Zinfandel from the Lopez Vineyard. (previous vintage pictured here) Like its name suggests, the Monga Zin was certainly a big wine. It was bright, true garnet in color like a ring my grandmother used to wear. Aromas of blackberry, blueberry, black tea, and spice rose to meet you as you poured the wine into the glass. Once there, a good swirl released something sweet, herbal, tangy--sassafras. I've never smelled sassafras in a zinfandel, but it was unmistakably there for me. The flavors were what you would have expected given the aromas, developing chocolate and pepper notes as you held the last drops in your mouth. It had 15% alc/vol, but it was nicely balanced and by drinking it at a cooler temperature it didn't taste rough or raspy. It's hard to assess the QPR on this wine, because I bought it on sale as a bin end for $18.99. At that price, it was very good QPR given its complicated and intricate flavor profile. But most retailers have this for between $22 and $26. First of all I don't know whether I'd plunk down that much money for a zinfandel without thinking twice, since there are some awfully good versions at lower price points. But given the complexity of this wine, I think even at around $25 it would still be good QPR. But the real message from this wine was not about QPR--it was about serving temperature. Serving wine too hot or too cold can mess up the flavors and textures of any wine. What the "right" temperature is for you may be as subjective a business as figuring out whether you prefer California or New Zealand sauvignon blancs. So do some experimenting with chilling wine down and letting it warm up and then try to remember it next time you drink that varietal. For now, I'll be serving my zins at 60 degrees. This post originally had a different title: Last Rose of the Summer. I had to laugh when I saw exactly this headline on Wannabe Wino's recent post. Apparently, we wine bloggers are often on the same page, and drinking the same wines! I changed mine a bit to compensate, but the point remains the same: these are the final days when it will feel summery to sit outside and drink rose. Like wearing white after Labor Day, drinking rose in October can sometimes feel a little sad. So why the title for this post? I wanted to remind you that even if you've sworn off rose as a summer wine, don't underestimate its value in November when you are looking for something to go with leftover turkey in the aftermath of Thanksgiving. You won't be able to find very many bottles of rose on the shelf then. Might as well pick up a few bottles of this wine now, because it would be great with a turkey sandwich, oozing with cranberry sauce and a lick of mayo. Of course, here in LA it IS still summer, and rose is a pretty attractive drinking option. 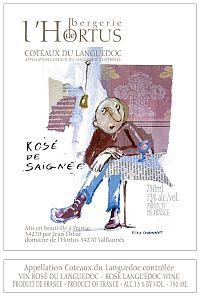 domaine547 gave me a bottle of the 2006 Domaine de l'Hortus Bergerie l'Hortus Rose Saignee to sample, and it was a perfect wine for these last days of summer, just as it will be perfect in a few months with your turkey sandwiches. Its deep rose color is striking, and an indication of how this wine was made. Roses made from the saignee process are really bi-products of red wine. After a brief contact between the skins and juice, some of the juice is bled out of the vats and this is saignee rose. 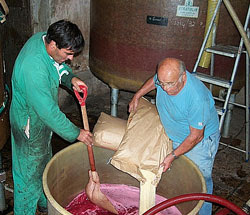 The rest of the wine in the vat then goes on to produce a big, tannic red wine and the rose wine is bottled separately. In this case the red wine became a Rhone-style blend of grenache, syrah, and mourvedre--which helps to explain the rich and robust nature of this rose. The 2006 Domaine de l'Hortus Bergerie l'Hortus comes from the Languedoc, and it smells like a southern French summer, with aromas of soft strawberry and wet stone that reminded me of a strawberry patch after a summer rain. These inviting aromas lead into a flavorful mixture of cranberry and strawberry fruit, with a nice contrasting note of mineral and stone on the finish. I often find American roses too fruity, and French Tavel roses too minerally--but this wine achieved a perfect balance between fruit and mineral notes. This rose was nice and dry, with good acidity at its core. It was, I felt, much better balanced than the 2005 Chateau d'Aqueria I had recently, which received many rave print reviews, but has had a much more lukewarm reception among consumers on CellarTracker. This wine costs less, too. You can buy yours from domaine547 for just $12.99. Excellent QPR, for a full-bodied French rose, in my opinion. If you're drinking this wine now, it would be great with grilled tuna, fried chicken, or poached salmon. Or whip up a bunch of pesto with lots of parsley and walnuts, cook up some cheese tortellini, and toss them together to serve with this wine if you've already consigned your BBQ to the garage. But don't forget: this is a great turkey wine, too. There are wines you drink. And then there are wines you talk about while you drink--but only to good friends, who also like to talk about wine, or your dinner companions will soon evaporate. I suppose you could spend nearly $10,000 on a single bottle of 2000 Domaine Romanee Conti Romanee Conti (hey, it's on sale! ), but I chose instead the 2000 Baron de la Charriere Vosne-Romanee 1er Cru Les Suchots ($29.95, Chronicle Wine Cellar). Oddly enough, though this was the most expensive Burgundy I bought during my spree at Chronicle Wine Cellar this winter, it was not my favorite, and simply represented good QPR in my book. But it did give all of us at the dinner table a lot to talk about as the wine evolved and changed and developed over the course of the evening. The 2000 Baron de la Charriere Vosne-Romanee 1er Cru Les Suchots opened up with a nice bright ruby color and tinges of brown around the edges known as bricking. A quick taste determined the wine wasn't corked or oxidized, although we were a bit worried since there was some slight signs of seepage on one side of the cork. The first taste was spicy and rich, with very little fruit. At this point, we were expecting great things. We pulled the cork and let it sit in the bottle for an hour. Then we poured our glasses and gave them a swirl. After an hour, the wine was much more aromatic, with black cherry fruit smells, cinnamon and spice. But it was more closed in the flavors department, with muted earthy notes. As we continued to drink the bottle, the earthiness of the wine began to emerge in the aromas, and the black cherry flavors developed along with more spice and growing complexity. Then the third glass had a metallic odor of tinned tomato paste which took us all by surprise. We let it sit, swirled it some more, and it became full of cinnamon, cherry, and earth. An interesting wine, but not one that most of us felt hung together very well. During the hours we sat at the table, no matter what we started talking about, we always came back to the wine. "What are you tasting?" "Do you smell aluminum?" "Anybody getting cinnamon now?" These were some of the questions that we shot back and forth, swirling our wine and taking sips. I honestly can't even remember what we ate with the wine. All I remember was that this was a wine that was a better talker than a drinker--at least to my palate. Have you ever had a wine that fit that description? So I was catching up on my blog reading over the weekend, and went to visit the Winehiker and a nifty little icon caught my eye. I clicked on it and it led me to a site called Adopt A Grape. It may be the coolest site I've found in a long time. And what a great concept! It's meant to help consumers like you and me learn more about the process of making wine--from budbreak to barrel aging. No money changes hands; this adoption is all about feeling a sense of connection to a particular grape varietal in a particular vineyard. It's packed with video clips, timelines that let you know just where the grapes are in the growing cycle, and you can leave comments and questions, too. I'm not sure who the genius was behind this, but the owners of the vineyards are Duane and Susan Hoff of Fantesca Vineyards, the folks who also dreamed up Fortune Corkies, blog about their experiences, and in general get what wine 2.0 is all about. All the grapes up for adoption are from their Spring Mountain vineyards in Napa Valley. When you sign up to adopt a grape, all you have to do is select a user name, a password, and enter your zip code. Then you are presented with some options of grapes for adoption. Once you adopt a grape, you will receive updates with pictures and information about the grape's progress. I had the choice of adopting some cabernet grapes, or some petite verdot. Of course, I picked petit verdot (how could I not, after loving the Escafeld PV so much?). Here is a picture of the location where my adopted petit verdot grapes are now growing and, according to the August 15 report, beginning to take on some color or veraison. And also a picture of the vineyard taken a bit closer up. Adopting a grape is a whole lot of fun--and it's free. In our hectic, modern, faster- than-the-speed-of-light lives, it's nice to be connected to something that moves more slowly, and that we can't control. I can sit by my computer, batting out emails and answering the phone, knowing that somewhere to the north the sun is ripening petite verdot grapes. And when they're harvested, I'll be among the first to know. Thanks to Russ the Winehiker who found this treat, posted the icon on his site, and got me hooked! It's hot in LA. Really, really hot. After a relatively cool summer, the Labor Day weekend was a scorcher. It was 108 degrees yesterday--and that's air temperature, not heat index temperature. Drinking wine in such conditions is not always pleasant. Sometimes, the alcohol does funny things in the heat, like give you crashing headaches and make you feel even hotter. And food. I usually pick what I'm going to drink based on the meal I'm making for dinner and in this heat wave I didn't want anything that was even tepid in temperature. I've never had a wine made with the picpoul varietal, one of the 13 Rhone varietals permitted in Chateauneuf du Pape. Despite its use in the Rhone, picpoul is (we think) native to the Languedoc-Roussillon and I had planned to save this wine for Dr. Vino's indigenous grapes Wine Blogging Wednesday next week--but I couldn't wait. 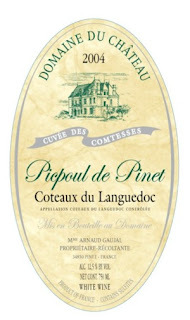 The name "picpoul" literally means "lip stinger," and all I can say is it's well-named! It was lip smackingly bright and acidic, but not in an unpleasant way. Instead, there were really bracing citrus and mineral aromas when the wine was poured. The flavors were of white grapefruit, fresh lemon zest, and a touch of pineapple on the finish. As the flavors held in your mouth, they took on an almost bitter edge, like lemon pith. This was tart, refreshing, and an ideal companion to the meal and to the hot late summer temperatures. For under $10, this represented excellent QPR in my book, and was a nice change of pace from California sauvignon blancs or a Spanish white. This wine would be perfect not only with shrimp, but with crab, oysters, or fish. If you're looking to beat the heat, this is the wine to pick up and eat with a cool salad and some critters from the sea. You'll feel cooler--and not just because you're drinking a hip, little-known varietal. This wine tastes like a cool dip in the pool--which sounds just about perfect right now. 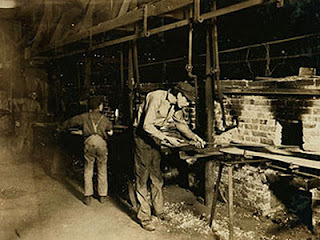 What is chaptalisation (or chaptalization, if you spell things the American way)? It's the technical term that refers to the practice of adding of sugar to wine during fermentation. This process, which was developed in the 18th century, raises the alcohol level, and in Bordeaux they impose a standard limit on how much sugar a winemaker can add. Bordelaise winemakers can only raise the alcohol levels by 1% by adding sugar. So the sugar isn't going in to the wine to make it sweeter--it's going in the wine to give them more alcohol and more body. Though some wines in past Bordeaux vintages, and other wines in other areas, have been watered down in order to lower the alcohol levels, signs are that the 2007 Bordeaux harvest will be requiring just the opposite. The European Union is looking into chaptalisation and may ban the process in future years. It is likely that winemakers would still be able to add concentrated must (unfermented grape juice) to wine to raise sugar levels, but not sugar. Already, however, Bordeaux officials have agreed that sugar can be added to 2007 sauvignon blanc grapes. At a time when many wine buyers are looking for the least manipulated wines they can find, and lower alcohol wines to boot, one has to wonder how this development will effect the sale of 2007 Bordeaux futures.